AWC-SB will host their annual holiday party on Wednesday, December 5, 6-8 pm at Carr Winery. At this event members and friends will celebrate holiday cheer along with honoring an AWC-SB Member of the Year and our Nonprofit of the Year. Nancy Marriott, of New Paradigm, Writing and Editing Services for Books will be honored as the AWC-SB Member of the Year. Marriott is a freelance book editor, author and coach with over 15 years experience in the commercial book industry and is a former board member of the organization. You can read more about Marriott at http://awcsb.org/2012/08/featured-member-nancy-marriott. The Nonprofit of the Year for the event is Domestic Violence Solutions. AWC-SB will recognize the staff, administration, volunteers, board, and residents of Domestic Violence Solutions for the incomparable work they do in our community supporting families to recover from domestic violence. Interim Director Loretta Redd, PhD will accept the award for Domestic Violence Solutions. Redd is an AWC-SB member and psychologist, business owner, nonprofit director, Air Force officer, writer, speaker, and executive coach. AWC-SB requests attendees of the holiday event to bring a gift for a Domestic Violence Solutions client: an easy-to-use weekly or monthly appointment calendar, day planner, journal and/or a pen and pencil set. “Residents have many appointments to track during their journey through legal and court appearances, job interviews and other obligations. They are asked to also keep journals of their personal transition, which is helpful to them in their therapy while in the facilities and beyond,” Redd explained. 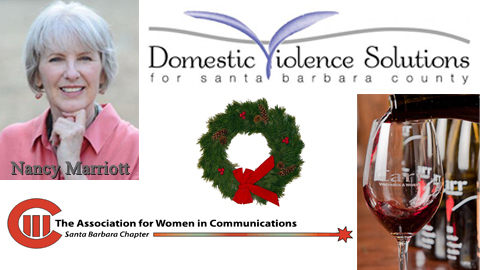 Dr. Lynn K. Jones, AWC-SB president, encourages interested attendees to bring a wrapped or unwrapped gift to the celebration on Wednesday, December 5 at The Carr Winery, 414 North Salsipuedes Street, Santa Barbara, CA 93103. Tickets are $15 for members, $30 for nonmembers and $15 for Students. This entry was posted in Past Events on November 21, 2012 by Lisa.